The idea of “becoming” has been an ongoing theme in my work wherein I use natural forms to articulate the cyclic process of change that occurs in both personal and social development. Having been raised in a deeply religious household, the theory of evolution was not spoken of, yet the trials of life led me to an understanding of nature as divine vernacular. Fallen leaves and seedpod forms inspire and inform my work with a visual language that alludes to death and regeneration. 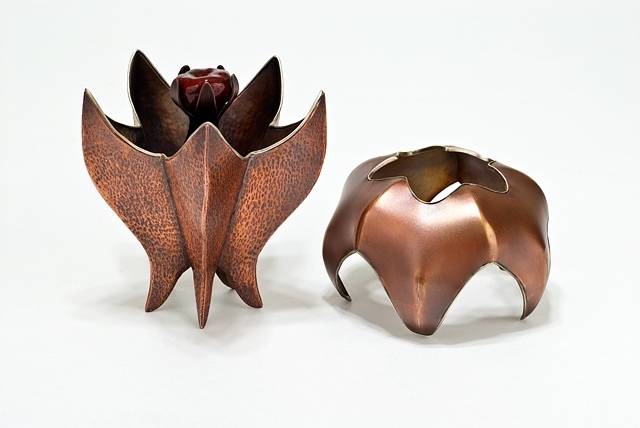 Experimentation with enameled copper wire mesh and methods of scoring and folding led me to fabricate pod-like forms representing the reproductive and nurturing qualities found in both nature and the relationship of a mother to her child. My recent introduction to textiles has allowed me to reassess the dutiful sewing skills I was taught as a child as a particularly fitting partner to metalsmithing techniques. The adaptation and growth that has occurred, despite struggles, within my own family has provoked a need within me to address domestic issues. By comparing botanical life such as the Sequoia, which requires fire for successful germination, with the family unit, I create a body of work that highlights the growth that happens when injury occurs.